Vista Equity Partners bought Marketo for $1.8 billion in 2016, taking it off the Nasdaq after an initial public offering three years earlier. Marketo's customers include Eventbrite, GE and Kaiser Permanente. Adobe on Thursday announced that it's acquiring Marketo, a company that sells marketing software, from Vista Equity Partners for $4.75 billion. The move could have implications for other competitors like HubSpot, Oracle, SAP and Salesforce. Earlier on Thursday CNBC reported that Adobe was close to announcing the deal. "Adding Marketo's engagement platform to Adobe Experience Cloud will enable Adobe to offer an unrivaled set of solutions for delivering transformative customer experiences across industries and companies of all sizes," Adobe said in a statement. Marketo was founded in 2006, went public in 2013 and was acquired by Vista for $1.8 billion in 2016. Marketo's customer list includes Canon, Charles Schwab, Eventbrite, GE, Microsoft and Hyundai. Marketo's CEO, Steve Lucas, will continue to lead the company inside Adobe's Digital Experience group and will join Adobe's senior leadership team, the statement said. The combination of Marketo and Adobe's Experience Cloud will form the definitive system of engagement for B2C and B2B enterprise marketers. Marketo's exceptional lead management, account-level data, and multi-channel marketing capabilities will combine with Adobe's rich behavioral dataset to create the most advanced, unified view of the customer at both an individual and account level. The result will be an unprecedented level of marketing engagement, automation, and attribution power, all with a goal of delivering end-to-end, exceptional experiences for our customers, where and when they want them. Adobe stock is up 78 percent in the past year. The majority of Adobe's revenue comes from its Digital Media business, which includes the Creative Cloud software. Marketing software is included in the Digital Experience business, which generated $614 million in revenue in the most recent quarter, with 21 percent growth year over year. 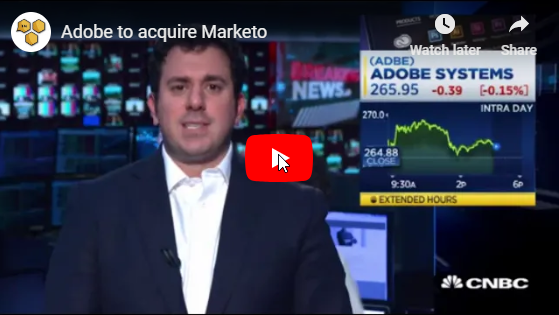 Adobe's software has proven useful for marketing directly to consumers, while Thursday's statement emphasized that Marketo offers marketing tools to people working inside of businesses. Both companies have many customers in common, Adobe CEO Shantanu Narayen said on a conference call with analysts following the announcement of the deal. "It was clear [that] joint customers were looking for this integration," he said. Marketo improved its go-to-market approach during its time as a private company, Narayen said.